Wise words from a beautiful mademoiselle celebrating her 126th birthday today. I consider myself quite lucky to share my own birthday week with my personal favourite leading lady in the world of fashion. My love affair with all things Chanel began with a grade ten fashion class assignment. Now while my own fourteen year old wardrobe choices often involved wide leg denim and crop-top graphic tees I still had the good sense to select Chanel as my designer of choice for our in class designer profile. 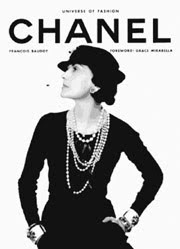 After an extensive period of research (remember this was pre-wikipedia days) I managed to stumble over my ten minute presentation on the life and achievements of Gabrielle "Coco" Chanel. And while my delivery was marred by the usual indicators high school awkwardness (nervous laughter, rosy cheeks etc) by the end of the class I had convinced myself, and hopefully some of my teenage classmates, that one day we too could embody the elegant beauty of this iconic designer. Ever since then I have looked to the past and present designs of Chanel as inspiration for a style of dress that is timeless in its classic simplicity. And while i've moved on from my sparkly doubled C's china town earrings and i'm only 6 months into my five year piggy bank savings plan for this bag, I still believe that regardless of income we can all take on some Chanel inspired pieces in our own wardrobes. So spritz yourself with some No. 5 and throw on your favourite black and white ensemble (with matching pearls of course) to celebrate the legacy of Ms. Coco and how far we've all come from our fashion challenged high school days. I heart black and white ensembles!! !